Most of us would have heard of Management Processes such as Procurement Management, Scope Management. But, how many of us remember about it? We must have read it in our books in textual format, which is usually once read and then lost. Now, you can experience a visually fascinating way of presenting the same information with interactive and engaging pyramids. Raptivity is participating in The Training & Development Show, Dubai, UAE from 4-5 December, 2012. Vinod Ganjoo, Sr. Manager - Business Development of Harbinger Knowledge Products will be presenting on the topic, "Using Ad-hoc Social Learning Environment for Leadership Development Program". The Training & Development Show will be covering latest topics in HR, Training and Workforce Development. Every content creator’s goal is to engage their audience with the most compelling and edutaining content. Developing live and online training has its own pre-requisites. 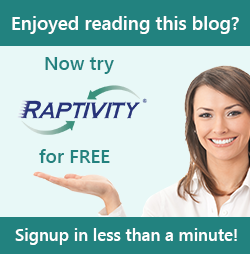 If you are unsure of where to start and discouraged with typical web platform interaction options then Raptivity is here to help you. We talk about evoking high content retention among the learners. It’s truly important be cause effective learning happens only when a learner can show it easily. However, we should also realize and accept this fact that we retain visually presented information much better than written text. Nadine Jeffers was the speaker at a recently held Raptivity Games Show Webinar. She shared with the attendees some very interesting stuff on how to gauge the best technology to use in creating interactive games for early childhood development. The games show extravaganza held on November 8th, 2012 was commendable. Game show experts like Nadine Jeffers provided very intuitive information on the basics and aesthetics of game building for early childhood development. The role games play in every child’s life was well explained. The hosts Jamaica Bracken & Janhavi Padture got the ball rolling with fun games like Mine the Gold, Million Dollars Quiz and varied samples created by users of Raptivity.